(WriteGood!WireServices) – Paleontologists have unearthed the fossilized skeleton of a dinosaur so huge that it probably was a bully that didn’t take criticism well. The remarkably complete remains discovered in Argentina reveal a behemoth that weighed some 65 tons and was 85 feet long. “It weighed more than a dozen elephants and was the length of at least five cars, all of them parked illegally in a handicapped zone,” says Professor Kenneth Lacovara, who discovered the creature. Gigantic Dreadnoughtus dinosaur was plant-eater. All the plants. Everywhere. Dubbed Dreadnoughtus schrani, the super-large dinosaur would have dwarfed its closest titanic rival, the FuckYouosaurous Rex, a meat-eater that was utterly insensitive to the feelings of others, says Lacovara. “We learn from fossil records that possibly due to their massive, bony armor and razor-sharp claws, many dinosaurs had an over-developed sense of entitlement, which is common in bullies,” explains Lacovara. Dreadnoughtus was no different. 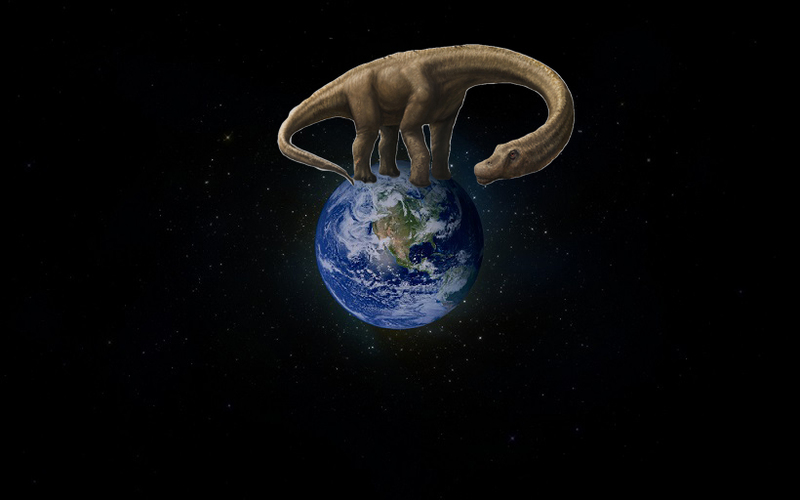 Clumsy and ponderous compared with other dinosaurs, Dreadnoughtus compensated for its own inadequacy and incompetence by stepping on them. Scientists have long speculated that dinosaurs were jerks. Adding greater validity to this theory is the discovery, close by the Dreadnoughtus dig, of the petrified remains of a smaller dinosaur’s lunch money.